Tiki Torch planters Brighten up an outdoor space. There are lots of ideas for how to brighten up your patio space for night time entertaining. Tiki torch Planters add a nice bit of ambiance to your parties and have a more natural look than normal lighting does. 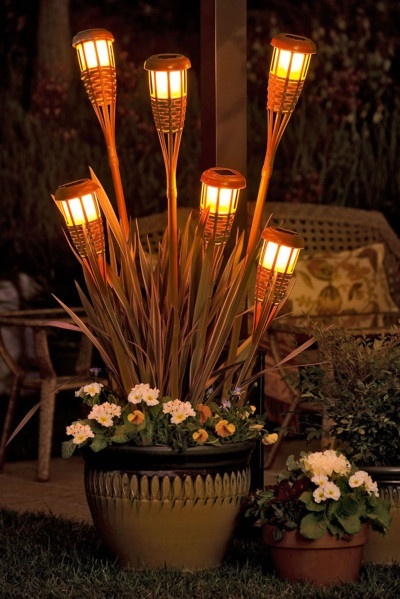 Tiki Torch Planters give a great light to your patio. We purchased a set of tiki torches last year for my daughter’s graduation party and they added a great atmosphere when it turned darker in the evening. They also kept the bugs away, which was a real extra benefit. But don’t just stop at the torches on their own. Add them to a planter! Since I have lots of these on my deck, this idea was perfect! For this project, you will need a large planter which is filled with the tiki torches. The extra plants at the base of the lights adds a great extra dimension to the project. For more details Instructions on the project Visit –>> Lowe’s Home Improvement. Where did you get the solar tiki torches or did you make them? What material are the planters made out of? do you need to use ceramic / stone or could you use a plastic planter? The project is one of Lowe’s Hardware projects and they suggest a clay pot planter.